and read the first page of the December 1955 Tiger Rag. 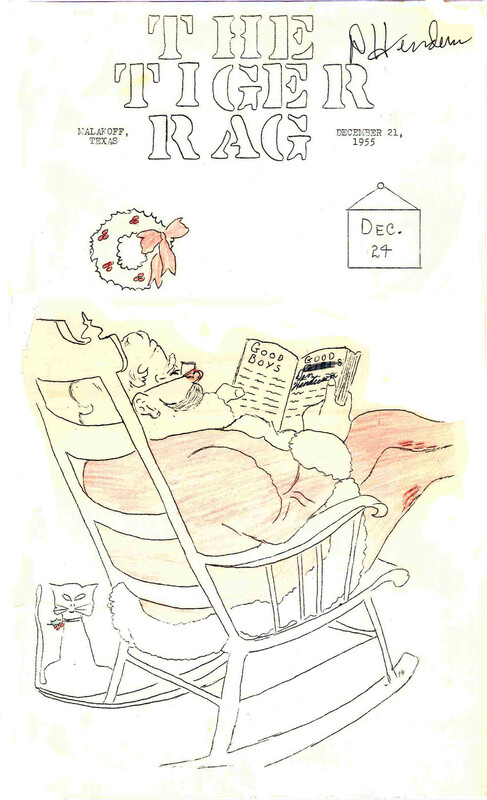 Things to look for: Mr. Starkey's article about Christmas, Loretta Sims' Christmas article, winning Christmas poems by Jill Fowler and Charlotte Evans, Santa Letters, Sports. I long for the "Old Days" when we had people like Norris Starkey who were not afraid to proclaim their faith. He is the kind of man and educator that has helped make America great!! I believe we have a few like this today and I am praying that they will show their faith and help keep America a Christian nation!! Please Email me ebadon@sbcglobal.net if you have any comments. In Case you need to return to an individual page you can find it here.